Our platform offers effective Test-Driven Learning which will be key to your progress. 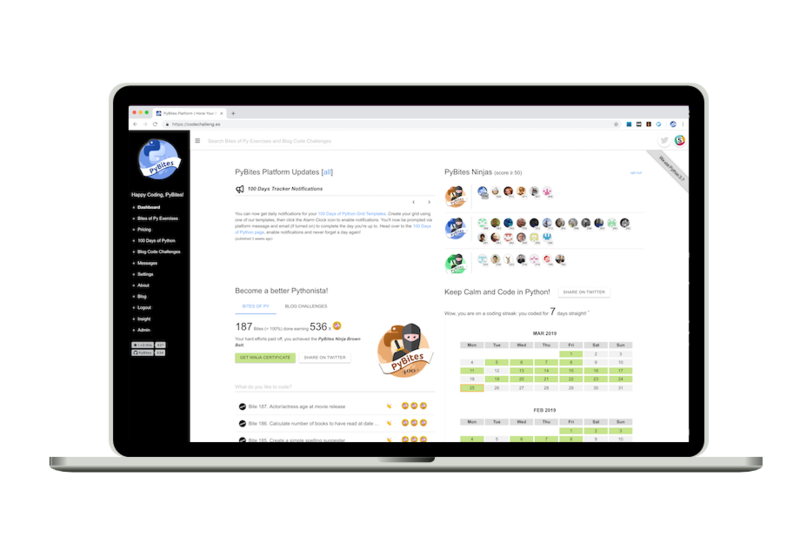 Join 6043 Pythonistas and start coding! There is only one way to eat an elephant: a bite at a time. PyBites was very challenging when I first started. But, I quickly found that the testing system provided helpful, instant feedback. The bites push you to learn new aspects of the language and how they fit together to solve a problem. The successes spur you to keep trying and this creates a virtuous cycle. It's a bit embarrassing but I started dreaming about Python! I can honestly say that the platform took me from beginner knowledge to intermediate. I definitely recommend it to anyone who would like to stretch their limits. I've been practising using other platforms such as Leetcode, and Hackerank, but I found PyBites significantly more advanced considering both content and website interactivity. Very recommended even if you are not new to Python! This is a great platform for getting started with Python and pulling you along to a decent level and beyond. It removes most of the 'what should I try or do next?' which can be the cause of a stall in learning. All you need to do each day is crack on with the next Bite or challenge, and your knowledge and skill grows along with the time invested. I'm hooked. I am still a Python newbie, yet the PyBites community has been as welcoming to me as if I were already a "Ninja." I've also been impressed with how much I've been able to learn just by completing the introductory Bites. I look forward to completing more challenges! To become a solid and confident software developer, you must stretch your skills and knowledge. You have to practice more than most areas of study. That is why #100DaysOfCode has connected with the community so deeply. However, when you are new it is very difficult to know what to build and to stay on track. The PyBites platform is a great asset to help focus your enthusiasm and keep you going for that amazing 100 days. PyBites is currently the best platform which follows the 'practicality' approach. The bites, exercises and challenges will bring a sense of solving problems which matches real world scenarios. So I'd recommend this to anyone who likes Python or programming to move out the shell and get hands-on experience. Good work, Bob and Julian and all other members of the community. The pybit.es slack channel is an excellent example of how friendly the Python community is. The founders, Bob and Julian, took the time to reach out to me and to chat with me. I felt very welcome as a fresh Pythonista. Dennis Ritchie said: “The only way to learn a new programming language is by writing programs in it”. This saying is completely justified by PyBites! Their platform gives you immense possibilities to play, experiment and learn with so many different types of pythonic problems, ranging from code challenges, bites and even their interactive courses. Apart from these, PyBites is a community of its own kind. You get help whenever you are in need. Since so many Pythonistas from all across the globe are active here, you get 24*7 support to continue learning in an efficient manner. I literally gained a lot from this place by solving code challenges and learning from and talking to great mentors who are always ready to give you the deepest insight possible. You literally can talk to them even for moral support. How cool is that, don’t you think? Come join our community and become a PyBites Ninja. Happy Coding! PyBites was instrumental in getting me up to speed fast with Python after a career with other technologies. Not only was it directly responsible for helping me land a great job but it also exposed me to many different aspects of Python programming that crosses multiple disciplines, something that very few resources do. 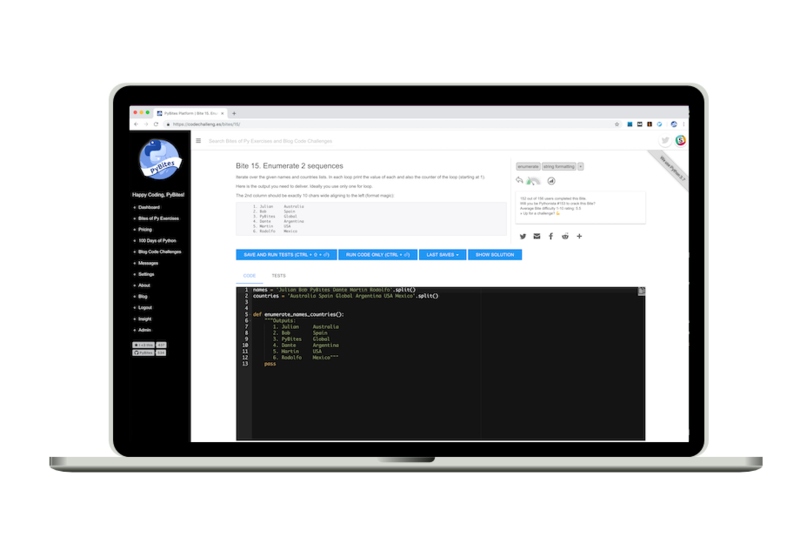 The exercises on PyBites provide feedback through automated tests and encourage learning Python-specific concepts. Feedback-based practice is the key to learning. I'd definitely recommend new Python developers try to solve a few of these exercises. Every bite of Py has been educational and I am continuously being pushed way past my comfort zone and have grown accustomed to an ever changing and dynamic environment. At this rate, I'll be a pro in no time! Thanks Bob and Julian! I spent about 2 months using sites like Udemy and Codeacademy and while they are good, I've learned more with the challenges here in 3 days than I have in the last 2 months of watching videos and doing very basic exercises. The challenges aren't easy but they do force you to code, fail, Google, read docs, Stack overflow, code more, learn and finally solve the problem. PyBites has been immensely helpful. Regardless if you're new to coding or an experienced developer, the greatest approach to hone and advance your skills is by coding daily. Even if just for 30 minutes a day. I've been teaching myself to code for a few years now and I've used countless resources to do this. But, NOTHING has dominated the benefits I've received growing my skills on PyBites. PyBites is a FANTASTIC platform with a GREAT and FRIENDLY community. There is ALWAYS someone willing to help anyone else out. You should come join us!! Read more about Test-Driven Learning here.